and then sometimes there are a few low points. My WIP from last Wednesday is again my WIP this week. The socks (remember those socks?) 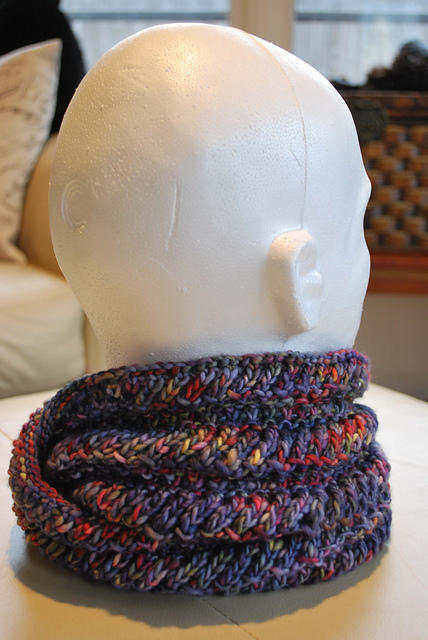 have been on the back burner ever since I signed up to knit a wonderful cowl pattern by Mamma4Earth on Ravelry. I was just about to finish the cowl's third repeat (of four) from the pattern when I realized I would run out of yarn. This was due to a very small error in the pattern. It was quickly remedied in the pattern and sent back out. In the meantime I was able to complete the original knit as written in three complete repeats. I took photos and sent them in and planned to leave the FO alone. ... but it kept staring at me. 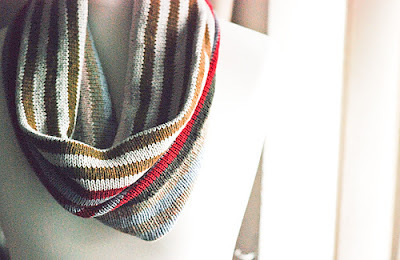 This project was the perfect combination of pattern and yarn and I just could not leave it in an imperfect state. I frogged it, rewound the yarn, and cast it on again :) With a little math I realized I could finish all four repeats of the new version of the pattern -- within the 210 yards of yarn I had -- if I cut back to 160 stitches from 200 and knit it on a US size 6 needle instead of a size 8. It was, and continues to be, a crazy fun knit. 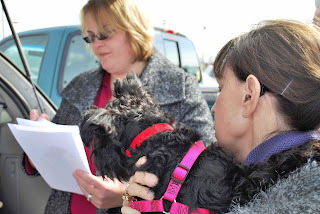 I want to thank Mamma4Earth and Carle', her trusty test knit coordinator, for the opportunity to be among the first. Because, as I said before, I LOVE it! What are you working on? Please leave a comment and share it with us! Today I am Ta-Da!-ing an FO of which I am particularly fond. 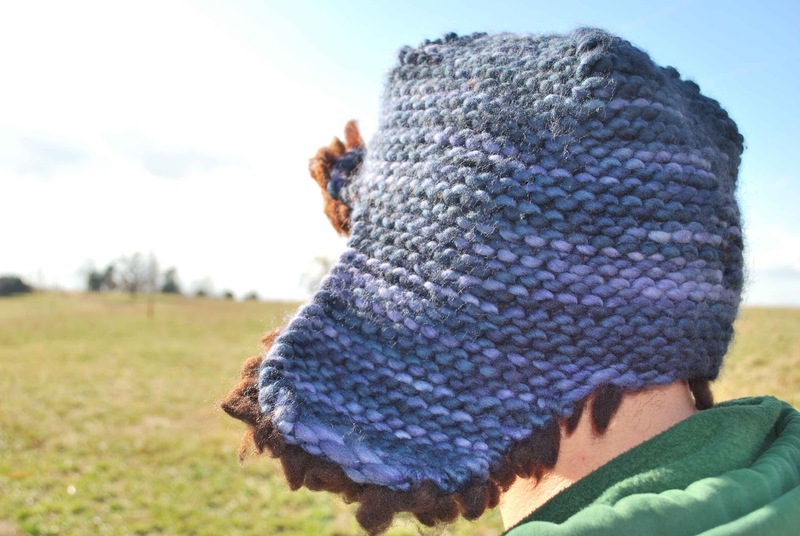 It has a history of sorts that goes along with the development of this hat. A very dear friend of mine, in fact she is the one who first taught me to knit, has always had an eye for charting her own designs. 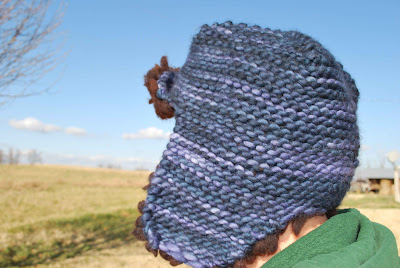 On one of our visits we were perusing some of her recent FOs and came across a hat she had charted for a family member. It was a beautiful hat! I asked her for the chart and she looked high and low for it, but to no avail -- it simply would not be found. Being particularly tenacious, however, we sat down and stared long and hard at pictures of the original hat until we had "re-created" this chart. I held on to it for a year or so and finally got around to writing up the pattern to accompany the charts and cast on -- I needed this hat for Christmas! In the end, I think it turned out beautifully. But if you are ever considering ribbing using Lion Brand's Wool-Ease in White Frost -- FORGET IT. 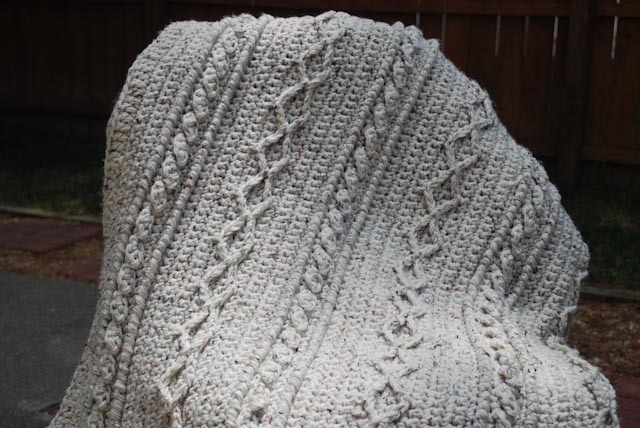 The MC yarn is Lion Brand Wool-Ease in White Frost. The CC yarn is Lion Brand Moonlight Mohair in Glacier Bay. The charting was done by my dear friend C.G.. You can find out more about her and her work on her blog, TheHippieHomemaker , and you can find her on Ravelry as GAGIN37. What do you think? What are you all working on? Leave a comment and tell us about it! The summers may feel like the 7th circle in Hades, but you gotta love Memphis in February! I hope you are all looking forward to the coming weekend! The weather forecast calls for sunny skies and mid 50's here in Memphis this weekend, but the Fiber forecast calls for a downpour of good fortune! Late last week I spun my first pair of singles (see Fiber Fever Friday # 19) and last weekend, I plied, set and thwacked my first ever 2-ply. 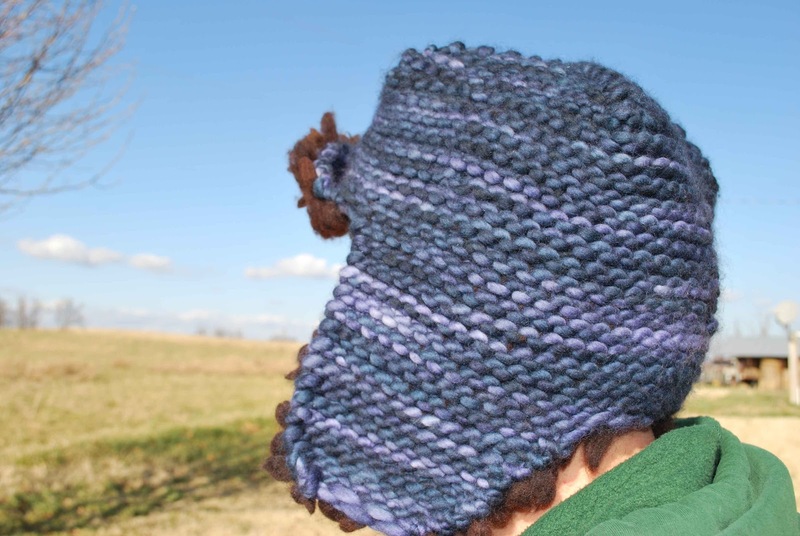 It did turn out to be a bulky weight yarn, but a great bulky weight yarn! I am very happy with the result -- although I do not think I will ever be able to use this yarn. It is going straight into the core stash! Not too bad, all in all, for a first hank. 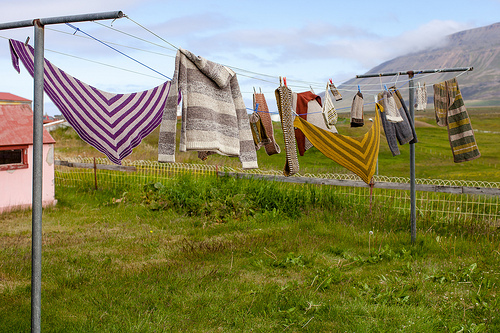 Have a wonderful Knitful weekend everyone! Joining Linda@Natural Suburbia and Steph@Woolythyme for Creative Friday and TamisAmis for FO Friday. Last spring I was in a not so local yarn shop and struck gold in a hank of Pagewood Farm's Kissi yarn in the Prism colorway. It is a beautiful (and expensive) yarn which reminds me of stained glass. I have seen these beautiful soft blues with flecks of red and green and yellow in many European cathedrals. Anyway, I had to have it but at the time could only budget 1 skein. I will admit that this skein went immediately into the "Core Stash" level of my stashdom where it should have remained forever -- as an inspiration yarn. However, late last week I ran across a beautiful cowl pattern being offered as a test knit. It was pictured in a beautiful shiny green yarn and it was titled Seaglass. My mind immediately went back to the hank of Kissi in the stash and its fate was sealed. Monday I received the pattern and cast on and it is nearly half completed as of this morning. Back in September, I saw a sample for a Cocoknits pattern and hatched an idea for a Christmas present. 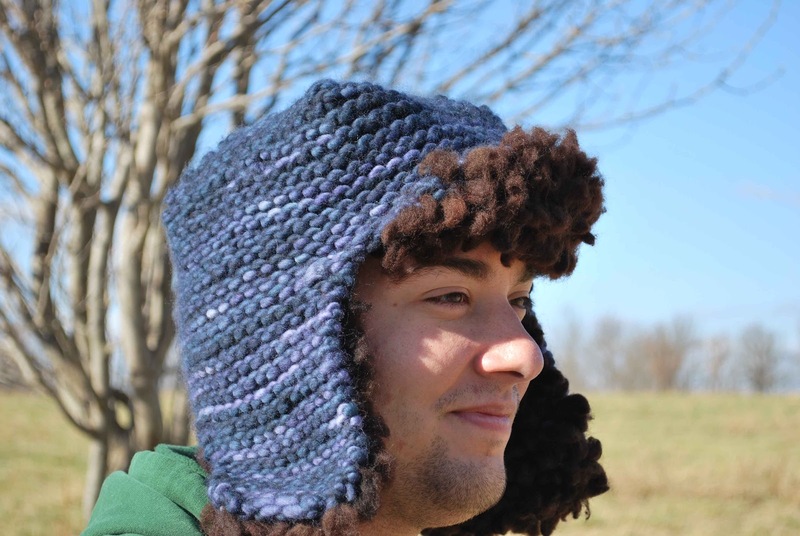 It was a cool hat -- good for the chill of winter and it would give me the opportunity to learn "thrumming". I made one for a family member and enjoyed it so much I made another for myself. 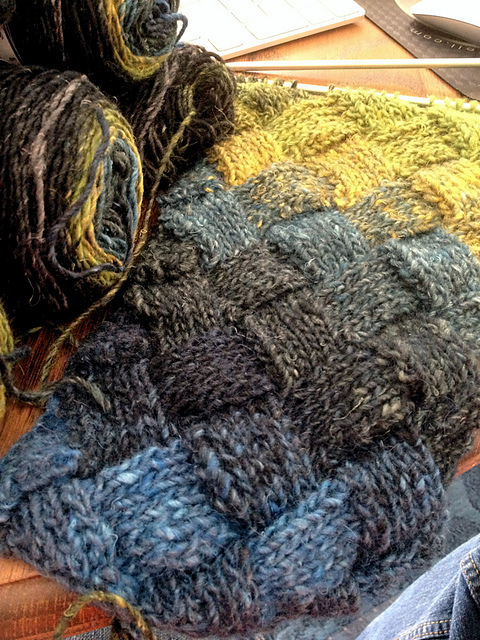 The yarn in both cases is Malabrigo Rasta (Tip: Knit the medium size to get a large hat in this yarn!). The thrumming is pure wool dyed brown... You can find my project in Ravelry here. I hope you all enjoyed yesterday's project Lexicon photograph -- I sure enjoyed that evening. It is certainly not a great job, but it will make an interesting bulky two-ply... I am just beginning to learn to spin after my wonderful wife got me my wheel a year ago. The wheel and I are still learning how to work together. Well, that is all I have for the moment, folks. I hope you all have a very relaxing weekend full of fun and fiber. I plan on staying home all weekend to work on Guild business and that nearly done pair of socks! Joining Tamisamis and Natural Suburbia for the Friday rounds! 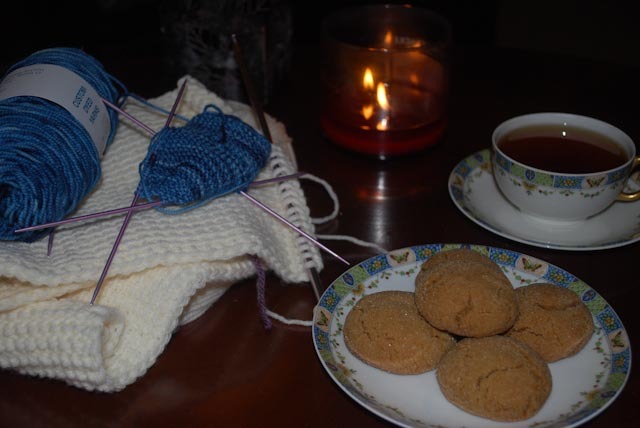 I am joining Steph@Woolythyme , Ginny@Small Things , and TamisAmis for Yarn Along / WIP Wednesday today. 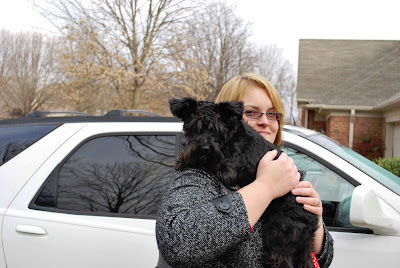 Please check out their blogs -- they are great bloggers and prolific crafters to be sure... I love sharing their links, but please do not come back and compare my photography to Ginny's -- she's an excellent photographer. It is WIP Wednesday, so let's talk about socks. I am still diligently working through my pair of boot socks. The leg is complete and the heel is turned. I am down to the arch of the foot on both socks and expect to finish them any day now. On the literary front, I am still listening to Thunderhead by Douglas Preston and Lincoln Child. The book is a great story about an archaeologist's desperate search for her father, closure, and fame while leading an expedition through a cursed Anasazi Indian tribe's "holy land". It is a very compelling read, or listen as the case may be. Clara Parkes is well underway with The Great White Bale -- an adventure she is sharing with Bale members as she and they explore the creation of yarn on a small industrial scale. Every two weeks we get a peek into the progress she is making as she has a 676 pound bale of excellent wool fiber milled, spun, and dyed. Later in the process, explorer members like myself, will each get to test the different versions of the spun yarn and provide feedback on the pros and cons of each form of processing. It is a fantastic and educational exercise in creating yarn! Although the Explorer memberships have all been bought, there are still armchair memberships available if you would like to join us in following the process of making yarn! You can check that out: here. The pattern was The Other Million by Brenda Burrell ( brendadada on Ravelry ). Not until this pattern did I begin to see the appeal of simple colorwork. 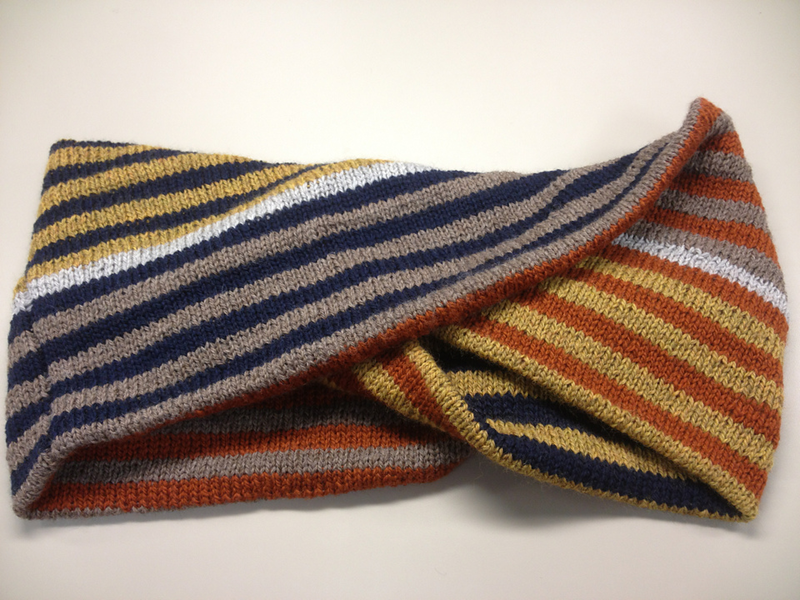 Simple colorwork can be beautiful, infinitely customizable, showy or conventional, the list goes on and on. I could not see that before because I was on a path to conquer knitting. Does that make sense? I wanted to attain the skill to do anything in knitting. Being a "good" knitter is not defined by being able to design and work your own Guernsey sweater. What I have come to realize is that I already have the confidence to do anything I want to do in knitting and so I should focus on making myself happy. 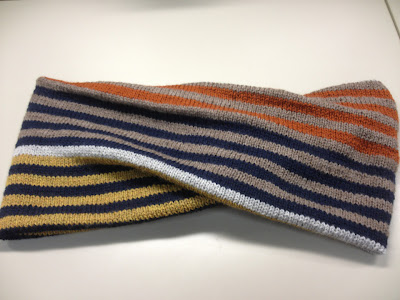 Colorwork, therefore, can provide a refuge from most of these perils. It can be simple and interesting to knit. It can be successfully wearable for many men and add a bit of extra color to their wardrobe. 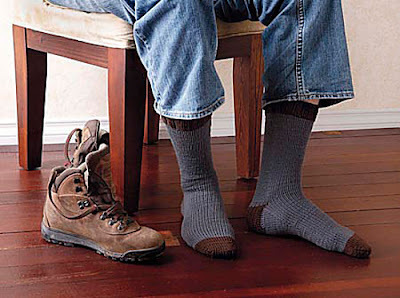 Many people do not want to knit men's socks because they are usually black, navy or brown and they consist of a lot of stockinette stitches -- again I am not saying they have to be bland, just that most men prefer them that way. Colorwork will let you add variety in simple stitches. I am probably singing to the choir or nobody at all... Most of you have probably already figured this out or knit for men who wear bright colors all the time... But for me, this changed the game in terms of my knitting goals. This meant that at any given time, if you saw two blocks together, they would share at least one color. The Other Million by Brenda Burrell. 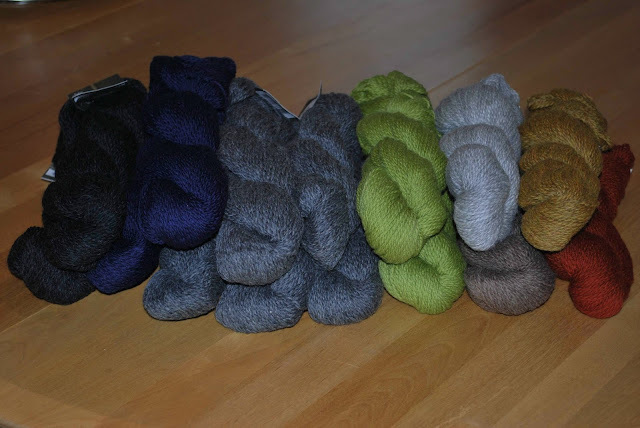 The yarn is Cascade 220 Sport Wool in colors Ginger, Straw, Navy, Silver Grey, and Walnut Heather. It was knit in the round from a provisional cast on and once the knitting was done, the ends were folded and grafted together (so as to create an inner tube). Let me tell you, that is a long graft! She loves to run and play and jump. Maci could jump 3 feet off the ground which is no small feet when you're 12 inches tall. She would greet us every time we came home like we had been away forever and although we only had her for 8 days, she had carved herself out a nice little niche in our family. 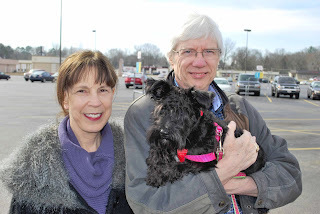 This past Saturday, however, we packed her up and drove with her to Corinth, MS to meet her new family. The hand-off was a sad affair. Maci was scared of the parking lot and clung to us looking for reassurance. 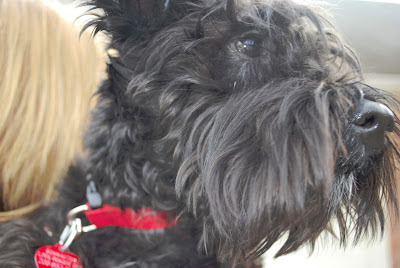 I am always amazed at the emotion you can see in a schnauzer's eyes -- and I could see that she was scared and confused. But she will be alright -- her new family comprises two loving and well schooled schnauzer lovers and 3 brothers waiting at home for her. I hope everyone has plans to stay in, keep warm, and knit the weekend away -- especially those of you enduring SNOWMAGEDDON this weekend! I wish we were getting a snow in Memphis this weekend, but, alas, it is going to be a dreary wet 50 degree weekend. The yarn is Lorna's Laces, Helen's Lace in the Sand Ridge colorway and it came to me through my LYS during a half price New Year's sale (I had been looking at this yarn for 9 months but couldn't justify the $50 per skein price tag). 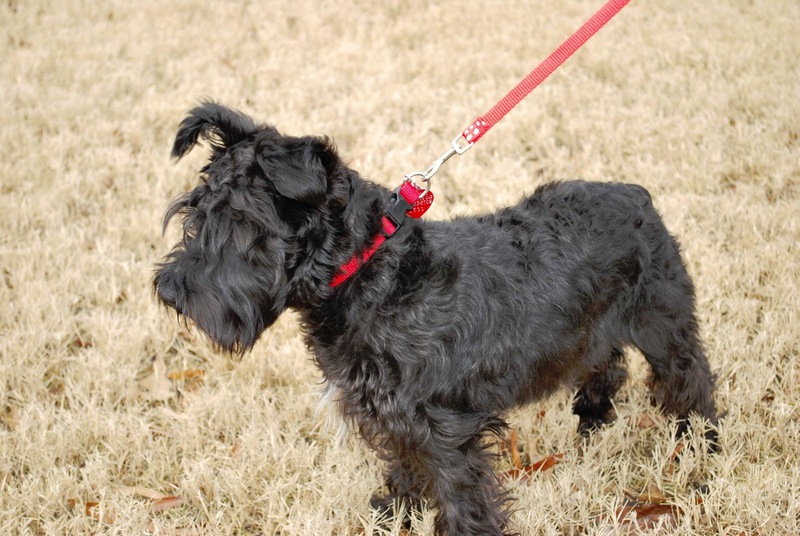 Linking with Tamisamis, Small Things, Natural Suburbia, and Woolythyme for the Friday rounds! I meant to post this yesterday... This week's word was Linear. Wow. What a start to the new year. If 2012 went out like a lamb, 2013 has come in like a lion. Lots of stress, angst, responsibilities, new friendship, fiber, group agendas (and did I mention responsibility?) -- so far it has been a roller-coaster. April will bring about the first Gathering of the Guilds (of the West Tennessee area). We are all getting together for a meet and greet. Hopefully we will be able to work out a social event between guilds for the fall. Unfortunately the Gathering takes place the same weekend as Stitches South so we cancelled our plans to attend and registered for the Gathering. If you live within driving distance of Jackson, TN and are a member of a Guild -- join us! So last month I undertook a massive Knitting organization and cleanup for the stash, tools, and pattern library. I am still working on completing some of those tasks but the work is coming along nicely. I frogged a couple of WIPs that were started, literally, years ago and now I am down to a crochet afghan, a knitted scarf, and a pair of knit socks. They are being worked in Noro's Silk Garden : Colorway 252... I am really enjoying the yarn. I had heard mixed things about Noro's Silk Garden but in my opinion -- despite the vegetative matter -- it is a beautiful yarn with a nice hand and a wonderful drape. I can't wait to finish this WIP. Finally, the sock pattern I am working came from Knit Picks. It is my first true pair of socks. I have made baby socks/booties, but this is the first adult sized pair. It is the free Boot Socks pattern from KP, knit in KP's Swish Worsted Marble Heather for the MC and in their Wool of the Andes Worsted Fedora for the CC for extra durability in the heel, toe, and cuff. The pattern is plain enough to be manly in the right colors, endlessly modifiable, and (best of all) it was free. You might think endless knit rows in grey and brown would be boring, but it is worsted weight after all so the progress is fast and this is my first ever 2 socks on 2 circulars project so I have that to keep me entertained! *** Hint: These would make a GREAT Christmas present for any man in your life. As for reading, well, I have had little time for reading for so long now that I cannot remember what I last read. I have, however, been listening to a great deal of books. 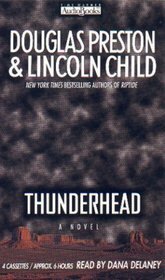 At the moment, I am revisiting a favorite from years ago -- Thunderhead by Douglas Child and Lincoln Preston. There are also lots of WIPs from Christmas to reveal in the coming weeks so check back next week for Ta-Da! Tuesday! Linked with Steph@Woolythyme , WIP Wednesday with Tami , and Yarn Along with Ginny.